We were hitting up places that were one or two £ signs in the guide book but would still be paying around £35 each for dinner, and that’s exclusing alcohol. I had a total of two beers and one G&T in our five day trip because I could not bring mysel to spend £8 on a standard bottle of lager. But regardless, we ate very well. 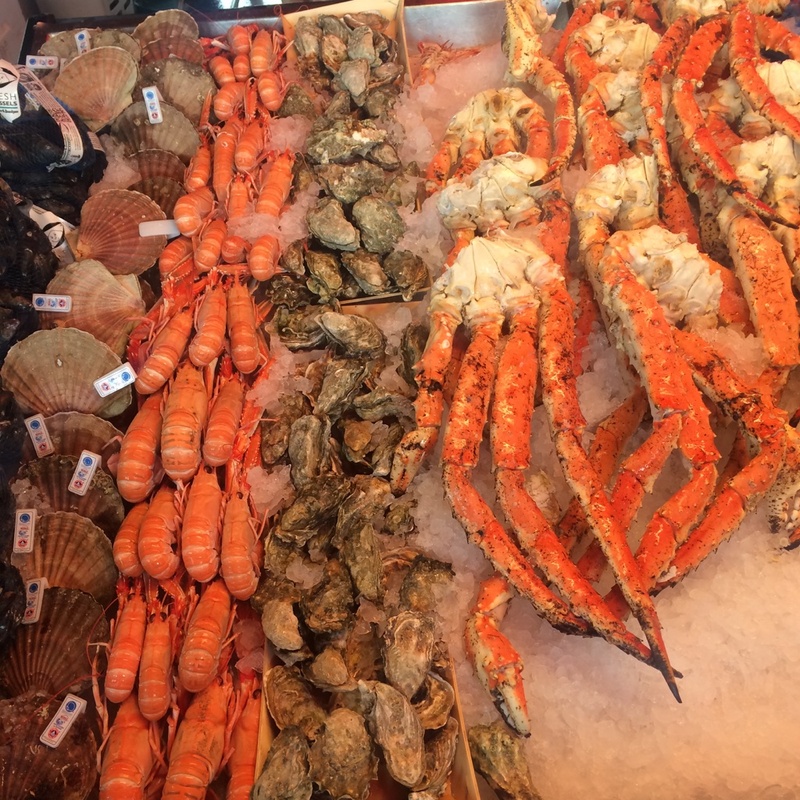 The seafood options are, of course, plentiful and absolutely delicious, and we indulged in a number of great cakes and pastries. 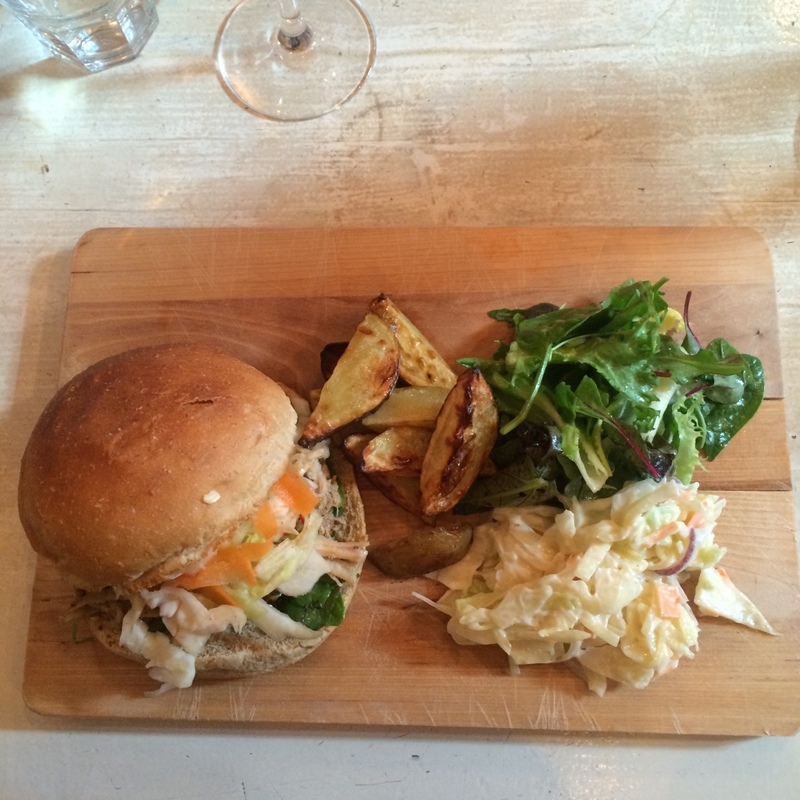 Here’s the best of what we ate in Oslo and Bergen. 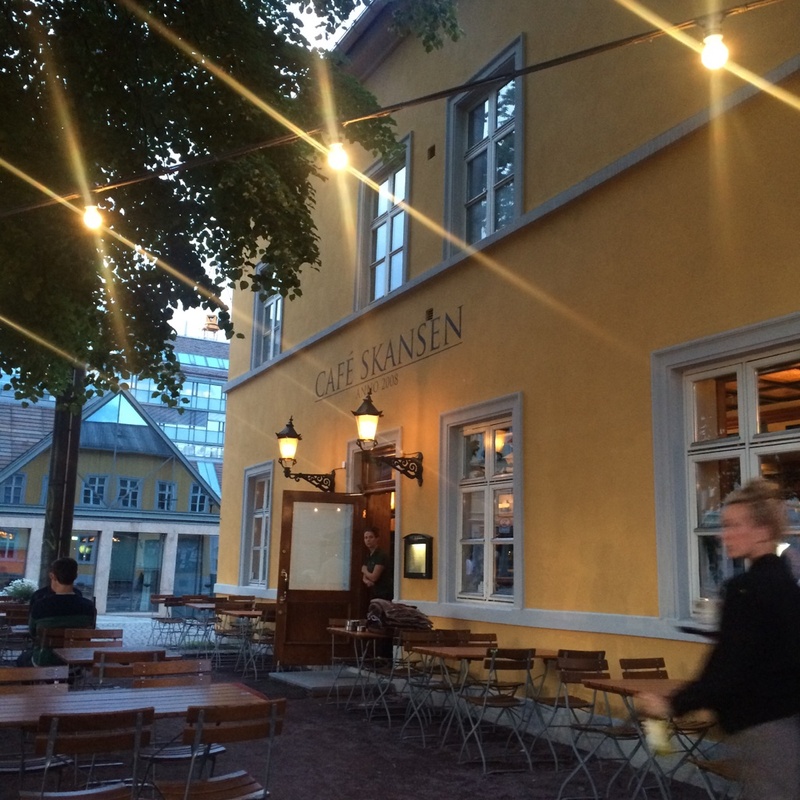 Our first day in Oslo we passed a place called Cafe Skansen on the tram and it looked so quaint and pretty that we went back for dinner in the evening. 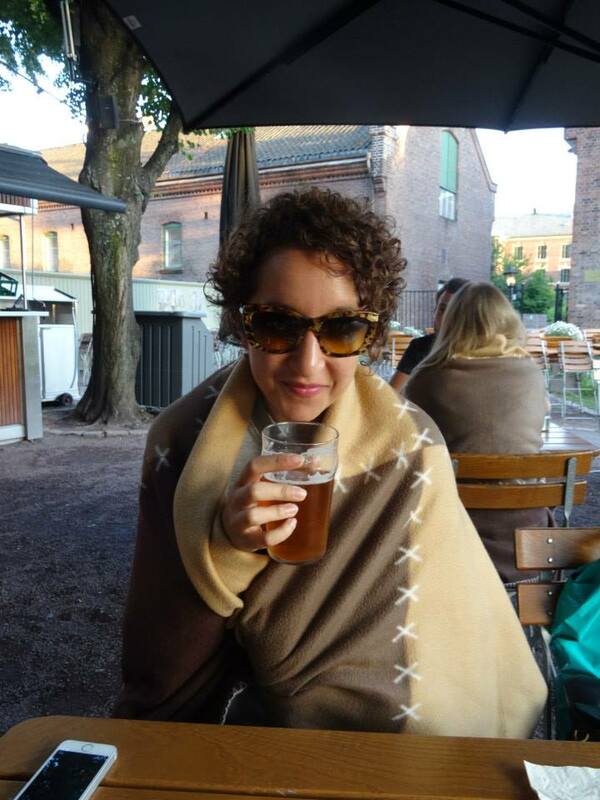 We sat outside, wrapped in blankets, waiting in vain for the sun to eventually go down. 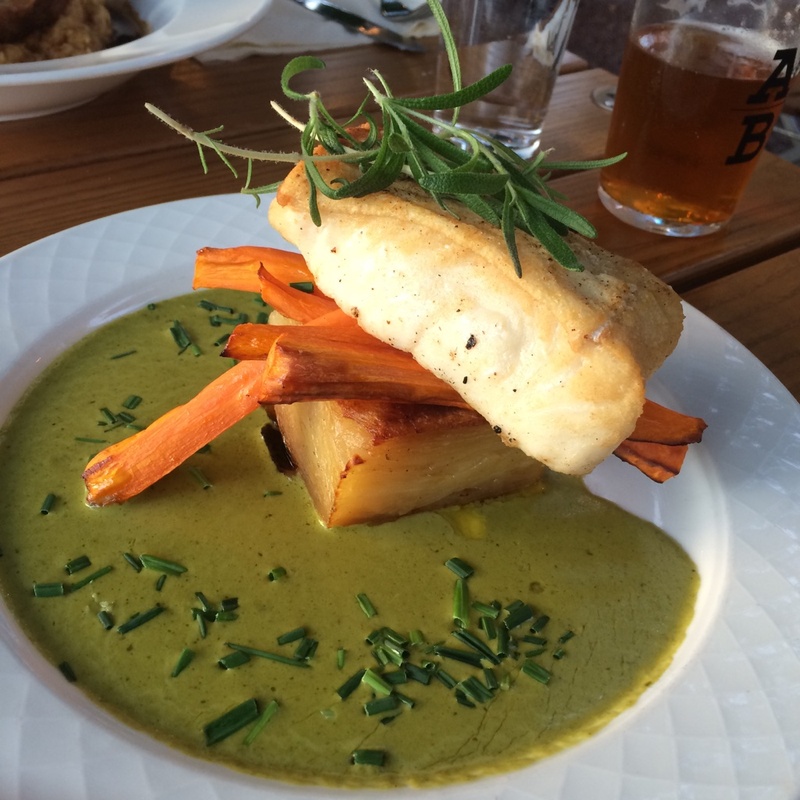 I had the halibut with baked carrot, creamy spinach sauce and pommes Anna. It is so rare to get a chunk of fish like a steak in the UK an this was thick, soft and delicate. The pommes Anna was flaky and crispy, with any necessary buttery tastes left to the sauce. It was a gorgeous way to spend our first evening in Norway. 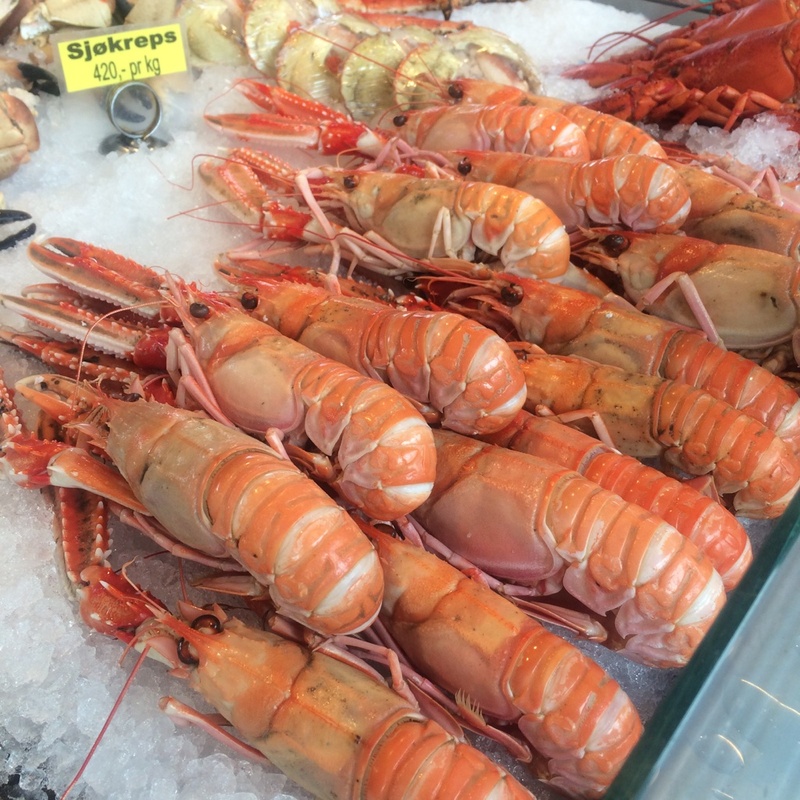 In Bergen we went to the famous fish market which is pretty small in size but there is an insane amount of variety available, and everything is double the size of what you’d find in a fishmonger in England (or at least in London). 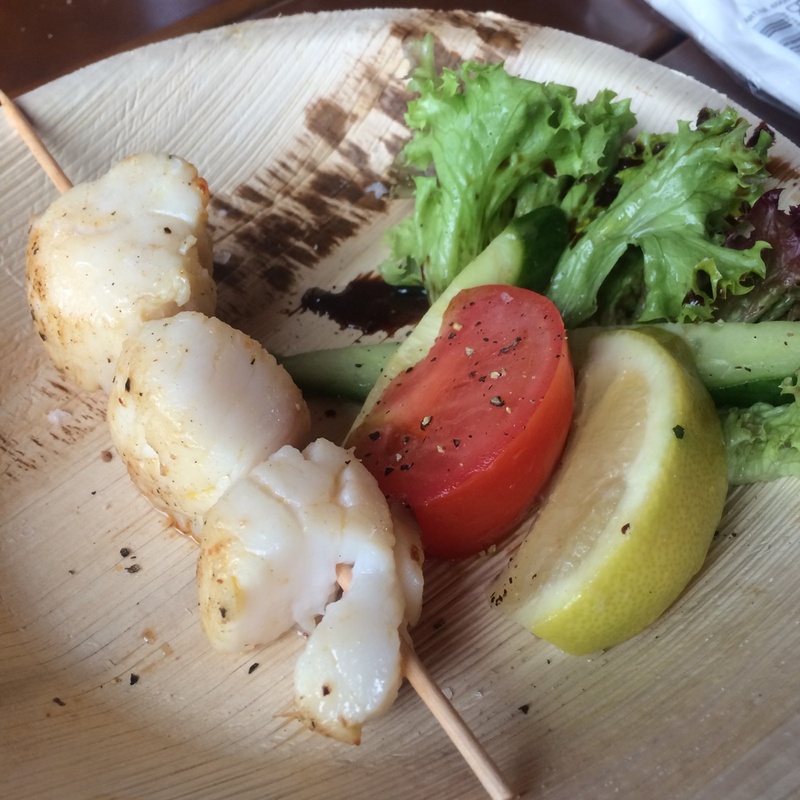 I had scallops on a stick that were simply grilled on a barbecue and seasoned with a little salt and pepper, but they were so incredible, I couldn’t believe how delicious something so simple could be. 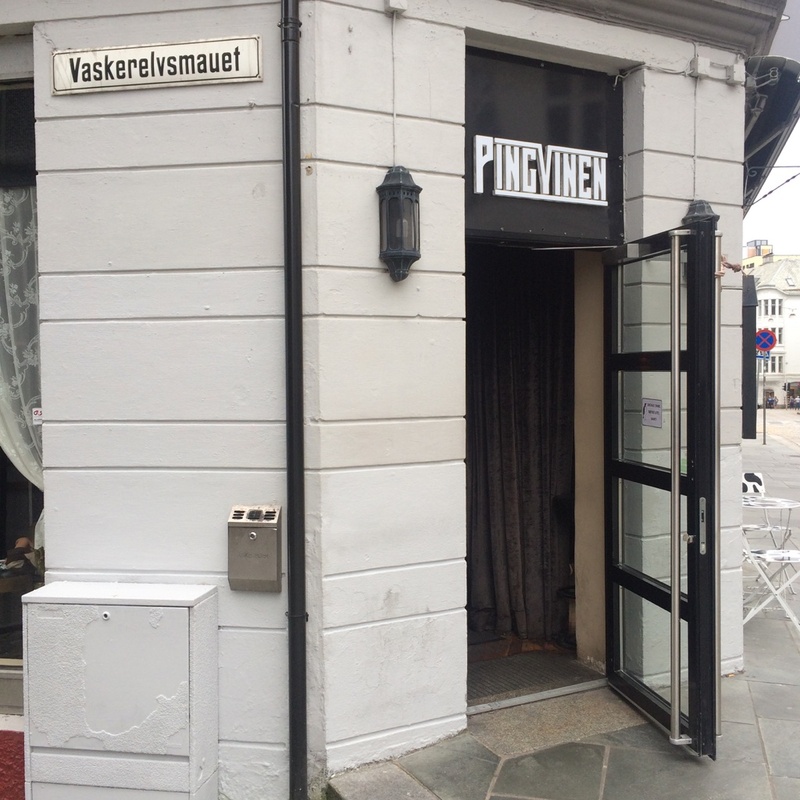 We ate in a little place called Pingvinen in Bergen, where every person in there had the same guide book as us and had clearly circled this as a place to eat. 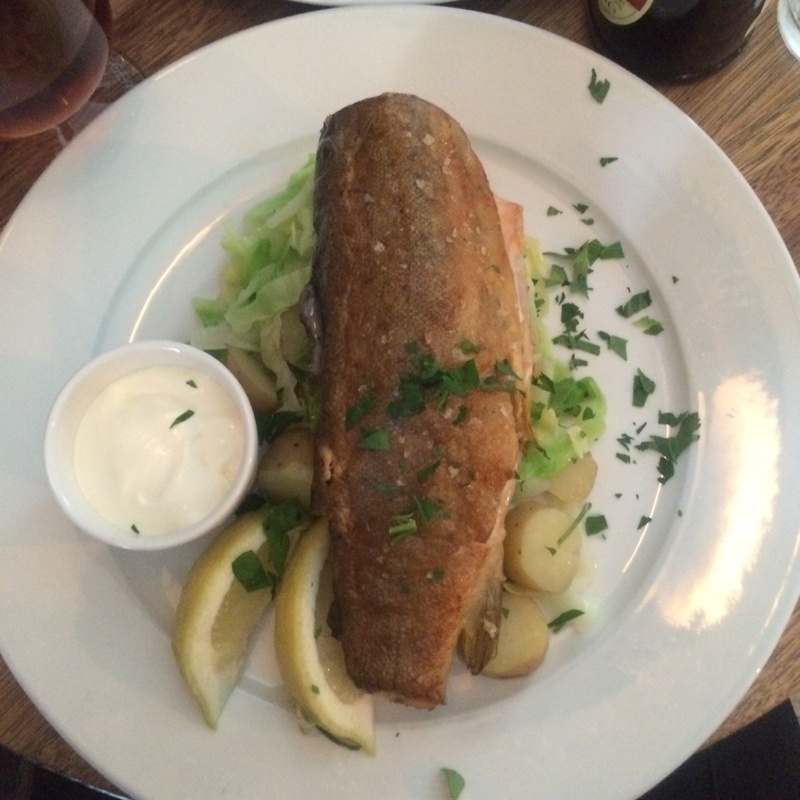 I had pan fried mountain trout with steamed cabbage and sour cream which was simple but really beautiful. The trout did not come boned which was a challenge, but I didn’t choke to death and I did enjoy the crispy skin and rich flavour of the trout. And every meal should come served with a pot of sour cream on the side! 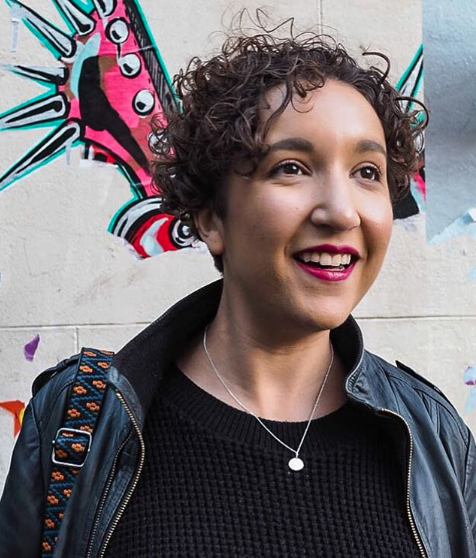 If you read about what I ate in Beijing, you’ll know that I like to try new foods and I’m not afraid to eat meat that isn’t widely available in the UK. So obviously when I saw reindeer sausage on offer at a food stall outside the Viking Museum in Oslo, I didn’t hesitate in ordering one. 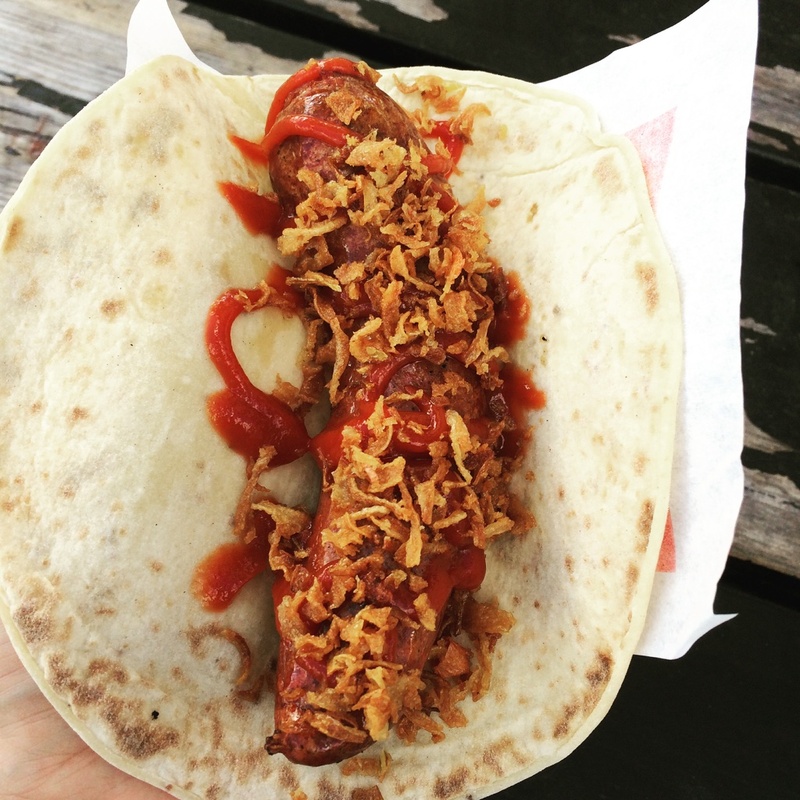 It came on a tortilla wrap, sprinkled with crispy onions and it was very rich, almost like venison. 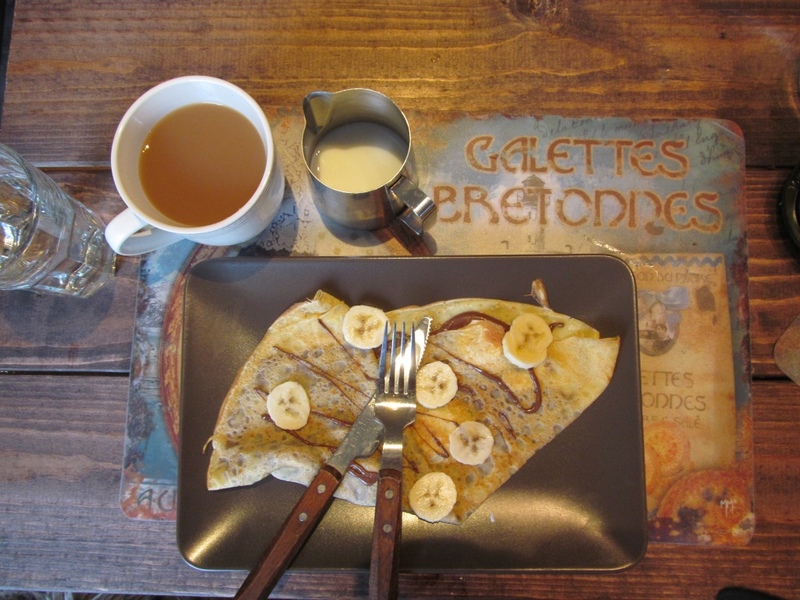 It was truly delicious; much nicer than the dried whale I had at Bergen Fish Market! I swore down that I wouldn’t eat a burger while I was in Norway but sometimes it just can’t be helped. 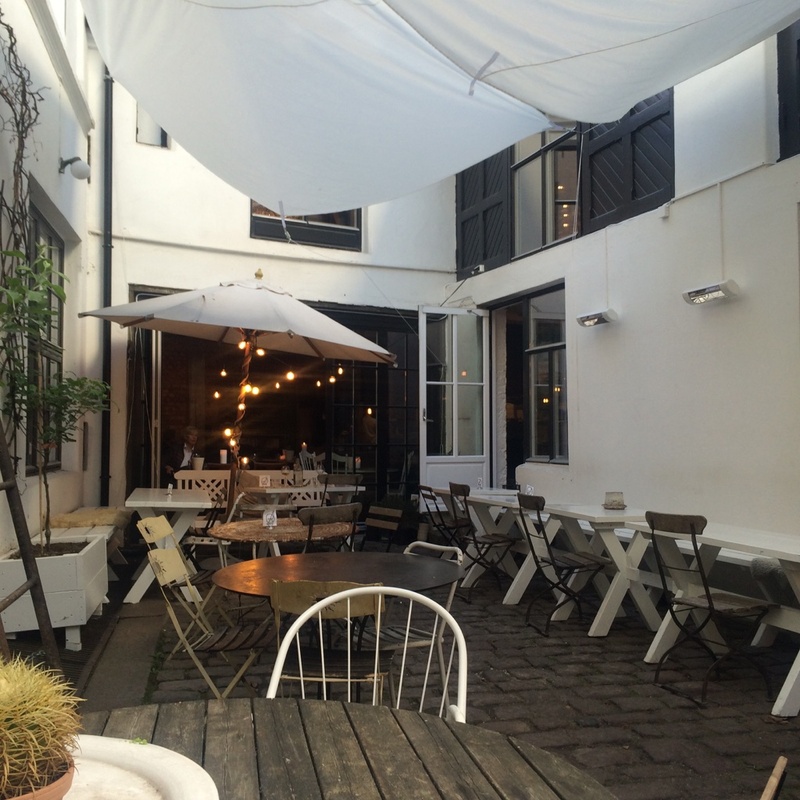 The first was in an adorable place just around the corner from our Air BnB called Kolonihagen Frogner, tucked down an unassuming alleyway and shrouded in fairy lights. I had high hopes based on the appearance of the place, but sadly the pulled pork burger we had wasn’t particularly mind blowing. The one saving grace was that we could get a pot of proper tea, a rarity in Norway it seems. At the other end of the spectrum though was the Royal Gourmetburger and Gin in Bergen. I had the pulled lamb burger with root vegetables, aioli and rosemary and it was one of the best burgers I have ever had, which is probably why I forgot to take a photo of it. It was so juicy and rich, I pretty much had my face an inch from the plate for the whole time as I practically inhaled it, occasionally stopping to sip on my fancy gin and tonic (Old English gin, 1724 tonic water and pomegranate, BOOM). 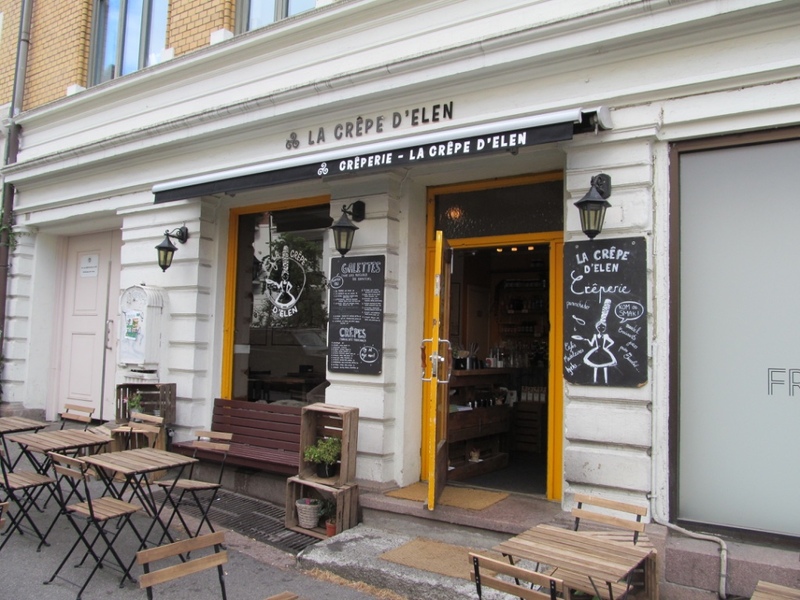 We had some great pancakes for breakfast in Oslo at La Crêpe D’Elen but really there are two sweets that you can’t escape from in Norway: apple cake and cinnamon buns, which coincidentally are two of my favourite things in the whole EVER. 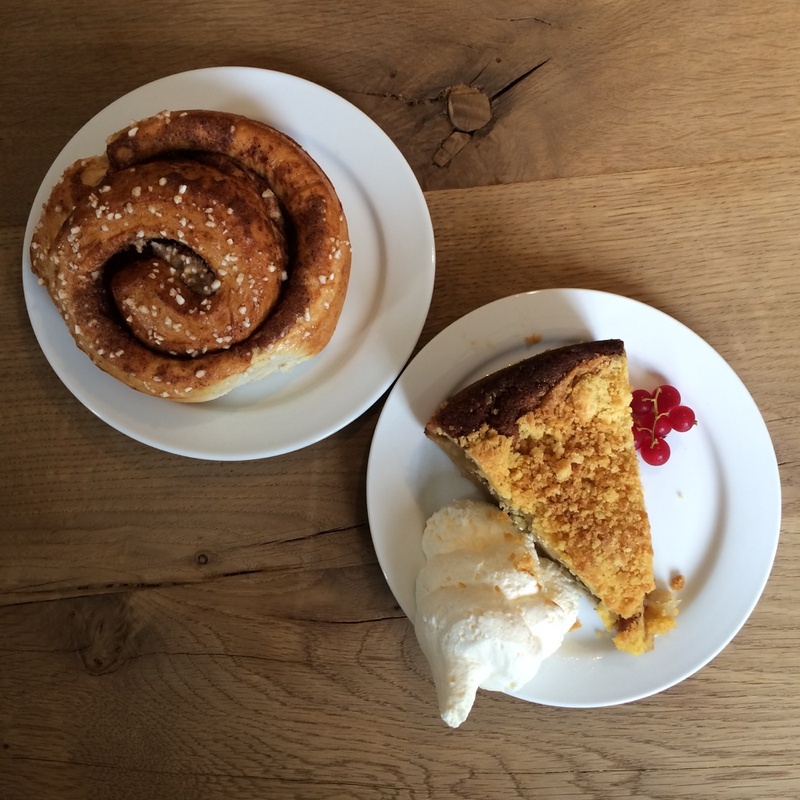 I couldn’t believe that the apple cake I had at the Oslo Folk Museum was as good as it was. Norway does fast food extremely well; I had a prawn baguette at Oslo airport and it blew my mind from the amount of filling and the fact it came with a lemon wedge. Where’s my lemon wedge from Upper Crust in Euston station?! 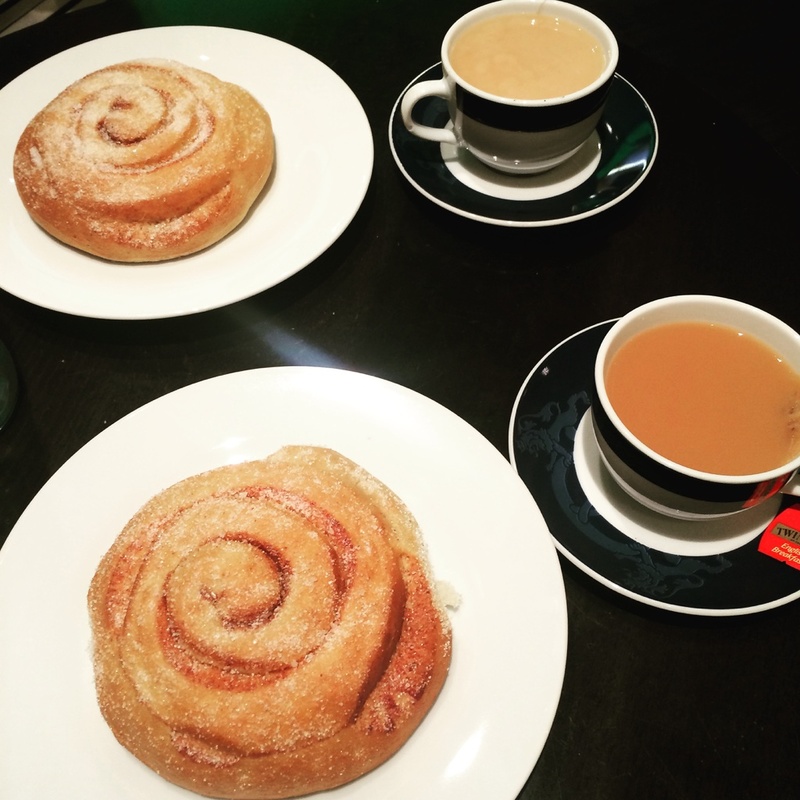 We had cinnamon rolls in various places but the best was in Bergen, the place the roll was actually invented. We escaped some torrential rain by going into Baker Brun in the old town of Brygge and they were being freshly made continuously while we sat in and watched the tourists wander in and out. It was big and fluffy and crunchy with sugar; I really had to stop myself from eating it in under 30 seconds. Luckily we spent the time that we weren’t eating in Norway walking and exploring. I’ve already written about my time in Oslo, and coming up soon is more about my Norwegian adventures including an incredible train journey through the mountains. Watch this space.